A recent Charity stamp issued by Australia. In December 2010 and January 2011, the Australian state of Queensland was devastated by severe floods. Although Queensland covers a huge area, 70% of it was affected by the floods. The damage bill rose quickly to A$2.8 billion. Despite generous funding by Governments and individuals, this amount of money is difficult to collect. 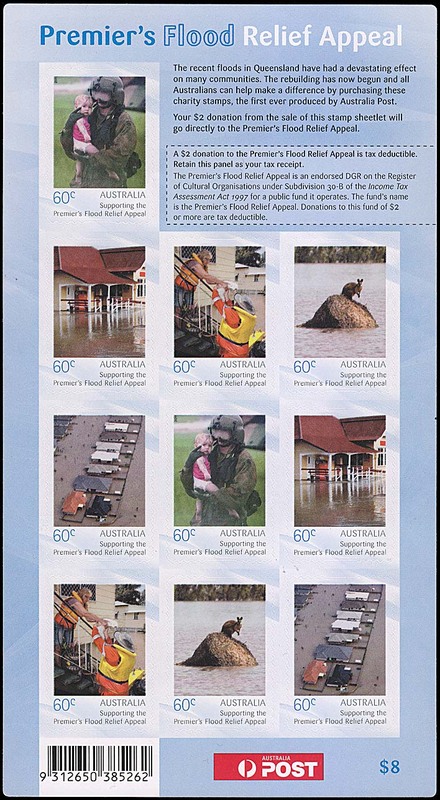 Hence, to support the Premier's Flood Relief Appeal, Australia Post issued a sheetlet of 10 self-adhesive stamps - two of each of five designs - each stamp paying the domestic letter rate of 60c. These sheets were sold at $8 with the difference being transferred to the Appeal. Australia Post initially printed 250,000 Charity Stamp sheets but was prepared to print as many stamps as were required to meet demand. It was an amazingly quick response by Australia Post. Media releases giving details of the issue were distributed at 2.15pm on January 25th. The next day, January 26 was the National Public Holiday for Australia Day. The stamps were issued nationally on 27th January at 9am. Glen Stephens has offered his comments about First Day Covers. The 2011 Australia Post Annual Year Book contained a special sheetlet of one image of each of the five of the stamps used on the peel-and-stick sheetlet. The stamps on that sheetlet were "normal adhesives" and they could not be procured separately.